Most people know the “doughnut” as a tasty snack. 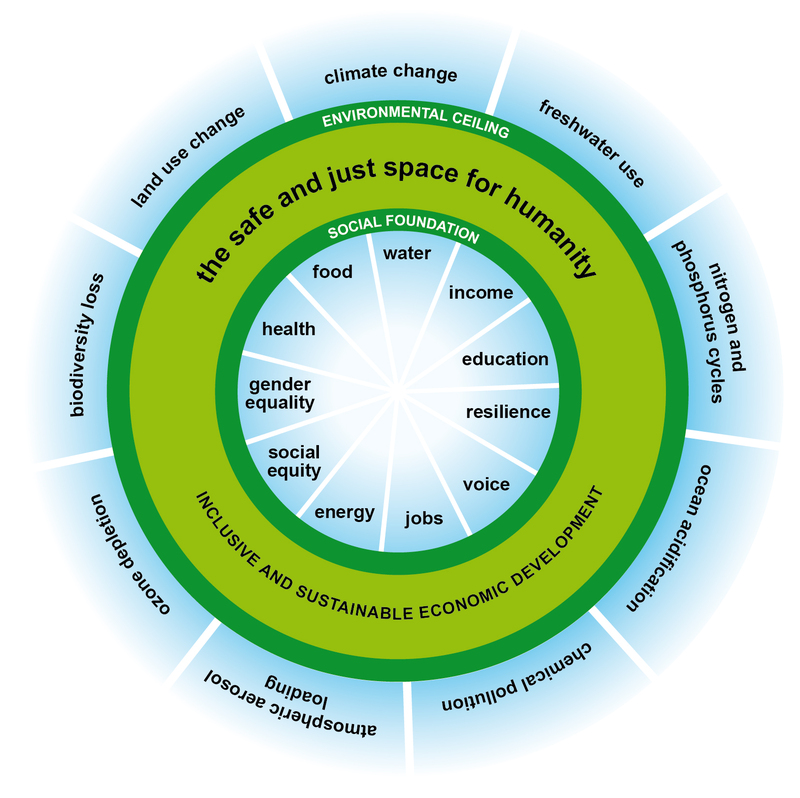 But increasingly, the word “doughnut” means something else: a visual model for thinking about how we must integrate the ecological limits of planet Earth, with the social and economic needs of the planet’s human inhabitants. It starts with the idea of “planetary boundaries” — the notion that there really are hard, physical limits to what humans can do on planet Earth, without radically messing things up for our civilization and for the rest of life. There are six other areas where we are definitely at risk for going over the line, ranging from how we use land and water to the chemicals we dump into nature. In order to keep the environment in a condition that can actually sustain life, they said, we need to stay “under the line” and in a the “safe zone” for humanity. Then along came former Oxfam researcher Kate Raworth. That’s all fine, she noted, but what about people’s needs? Yes there is a ceiling, a limit that we should not breach, when it comes to growing our presence on the Earth. But there is also a floor: a minimum amount of economic sufficiency and social fairness, which every human being deserves. Thus was born the “Doughnut”: a representation that combines the notion of staying underneath Nature’s ceiling of tolerance, but above the floor of a decent living and fairness for all human beings. Sustainable development, says the Doughnut, is about aiming for the “sweet spot” that is in between those boundaries. But what does the Doughnut really mean? And how can you actually use it (since you can’t eat it)? The 17 Goals of the UN’s 2030 Agenda are, in many ways, another way of describing the Doughnut. There, in the SDGs, are the environmental boundaries of the Planet — climate, pollution, waste, habitat for life — but also the many dimensions of an economically sane, socially healthy, humanly desirable life. And with the Doughnut, it’s all in one picture, together with the notion that there is a kind of “optimal space” towards which we should be aiming. The Doughnut provides us with a kind of “overall goal” or destination: the ring of the Doughnut itself. If we can arrive there, the indicators would show us happily living in harmony with the Earth … and with each other. Explaining this “big picture” is often no easy task. And while there are many other ways to do that explanation, the Doughnut is a particularly good one. So, if you are a teacher or trainer or someone whose job involves making decisions that could affect, well, any of the SDGs, consider the Doughnut. Introduce it to others. Show them how we need to make decisions that pull back on those things that are frankly destroying the natural world (on which we absolutely depend) … while pushing forward on those topics where not everyone has enough. 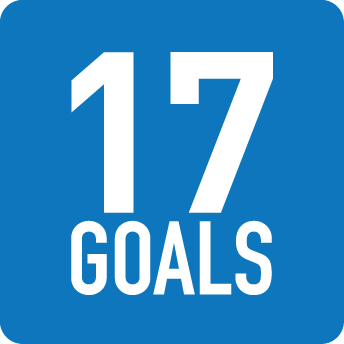 Granted, the Doughnut is not a very simple picture … but it helps make the complexity of our world, and the 17 Goals challenge, a whole lot easier to take in. The website www.doughnuteconomics.org links you to Kate Raworth’s personal blog, where you can learn a lot more about this framework. For more on the original “planetary boundaries” concept, on which the Doughnut was built — and which has its own life as a crucial tool for understanding the physical limits of our planet — visit this web page at the Stockholm Resilience Center. Great thanks for a new tool for me, as a teacher and coach. As a teacher of Lessons for Sustainable Development I can use this model at the first lessons for visualization and better understanding. As a coach, I can ask participants of work-shop to help me in building or “cooking” of such Doughnut.